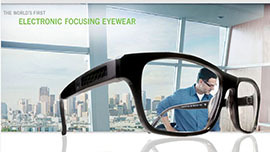 Mitsui Chemical Corp., under license from e-Vision, is commercializing electronic eyeglasses using e-Vision’s non-tunable, diffractive lens technology, which typically allows only for an on-off approach to seeing near and far. In the next generation, product currently under development, the voltage profile of the electronically-focusing eyeglasses will be determined by the patient’s prescription and different presets can be programmed, with three or four easily-accessible default settings. There are different ways the lenses can be adjusted. Changes to the voltage profile can be made remotely, for example from an app on a smartphone. Another option is to have the electronics in the frame of the glasses, so that a tap on the frame causes the adjustment. More desirable is to have the electronics in the lens, so they work with any frame. Anatomical methods are also being explored, which will eliminate the need to use your hands to adjust the focus. Using e-Vision’s licensed technology, Italian manufacturer, Adaptica S.r.l. has developed the VisionFit™ electronic phoropter which received CE Mark in 2015 and is available for sale in Europe. This wearable and mobile system enables the eye examination to take place more comfortably while also increasing the patient’s peripheral vision. Its compact size requires less office space and reduces examination time. VisionFit offers the same standards of speed, fluidity and symmetry of digital phoropters with adjustable step resolution down to 0.05 D (spherical lens). With current technology, content seen in these displays goes in and out of focus when moving from near to distant objects and vice versa. E-Vision can develop light, small, solid state, low power consuming optics that will keep the content of head mounted displays in focus when the user focuses on near and distant objects. An anatomical method of adjusting voltage could be most beneficial here, to allow hands-free adjustment of the focus. 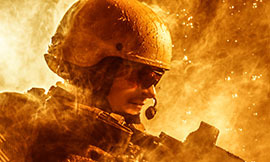 For example, soldiers will not have to take their hands off weapons to make manual adjustments or wait for the head mounted displays to catch up with rapid eye movements which can be quite responsive for young soldiers whose eyes accommodate quickly. E-Vision is developing a working prototype of an Electronic Contact Lens (ECL) that can be inserted in the eye, focused and powered wirelessly. The outer layers will be composed of appropriate polymers to allow for oxygen flow and will be invisible to the wearer. The optical portion of the lens is 6 mm and is the thickness of a human hair. The wearer can adjust the focus of the lens through a range of up to four diopters. The four diopters are in addition to the fixed, base optical power established by the wearer’s prescription. Pre-set ranges for far, near and middle-vision can be set and even fine-tuned to the individual’s own needs. For the majority of the population, this will eliminate the need for current treatment options such as multi-focal lenses or mono-vision. Additionally, the lenses can also be made to adjust tint, like sunglasses. Incredibly efficient, unlike early ECL prototypes, e-Vision’s ECL electrical power requirements are lower so they can hold a charge independent of frames or wearable charging stations. The ECL itself will carry its own charge so that usability will be consistent with standard specifications set by the lens manufacturer. Currently, charging will be included as part of the cleaning kit. Future charging techniques being explored include battery, piezo electronics, anatomic charging, or inductive (wireless) charging. If the ECL should lose power or experience a fault, it will simply return to its unaltered optical power with no risk to the wearer.